By-catch on Lake Winnipeg. Critics say a quota system, coupled with government inaction on potential campaigns, is leading to the illegal practice. WINNIPEG—With the recent demise of the Canadian Wheat Board as a single-desk buyer and marketer of western Canadian grain products, some say that the western inland fishery should be next. Critics, such as Winnipeg Free Press contributor Kim Sigurdson, and right wing think tanks like the Frontier Centre for Public Policy, have their sights set on the Freshwater Fish Marketing Act (FFMA). 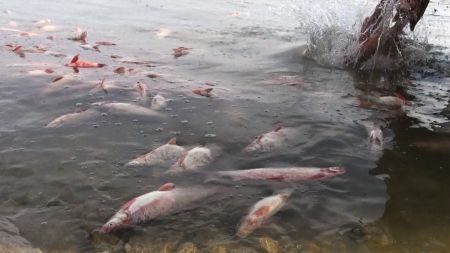 While fishers working the western inland fishery may agree with some of these critics, the issue of wastage in the fishery is of more immediate concern. As the federal act currently stands, Winnipeg-based crown company Freshwater Fish Marketing Corporation (FFMC) maintains a monopoly over the supply of freshwater fish from the western inland fishery, which includes Manitoba, Alberta and the Northwest Territories. Founded in 1969, FFMC acts as the sole purchaser of freshwater fish from over 2000 fishers in the region. In 2011 and 2012, respectively, Saskatchewan and northwestern Ontario opted out of FFMC. However, commercial fishers in Saskatchewan can still choose to sell their harvest to the FFMC, an option which many fishers exercise. Northwestern Ontario’s commercial fishery has largely been replaced by the sport fishing industry. FFMC processes and then markets fish to over 14 countries and 20 US states. Annual revenue for the FFMC tops $65 million, $50 million of which is generated in Manitoba. But critics of the current FFMC business model argue that the world is a different place today than it was is 1969, and that fishers ought to have the ability to sell their fish to any processor, distributor or packager they can, and for the highest price possible. The fishery on Lake Winnipeg, the largest managed by FFMC, provides seasonal employment to 800 fishers in a variety of communities, the majority of whom are Aboriginal. Gerald McKay, who self-identifies as an Aboriginal fisher in Grand Rapids, Manitoba, is a member of the Grand Rapids Fishermen’s Co-op, and has been involved in the commercial fishery for over 20 years. While McKay isn’t calling for the abolition of the FFMC, he does believe that it may have outlived its usefulness. “Freshwater’s gotten top-heavy with bureaucrats and that, administration and staff,” McKay told The Dominion in a telephone interview. Both McKay and Sigurdson take issue with the low prices that fishers are paid for their product in the face of high operational costs, particularly those of gasoline and transportation of product from lake to market. The price that FFMC is paying for fish, in fact, is decreasing. While McKay may believe that FFMC has outlived its usefulness to northern fishers in terms of being able to properly pay them a living wage, the issue he takes truly to heart—and is campaigning against—is waste within the fishery itself. As a result of the price disparity paid by FFMC to fishers for different species, the monopoly FFMC holds over the western inland fishery and the strict, non-species-specific quota system in place in Manitoba for commercial fishers, many fishers illegally discard lower-valued fish such as whitefish, in favour of higher-valued fish such as pickerel. As a result, widespread—and undocumented—wastage of fish threatens the long-term sustainability of the Lake Winnipeg fishery. Currently, McKay is working with the Environmental Conservation Lab at the University of Manitoba, the Grand Rapids Fishers Co-op and Winnipeg Harvest to develop a pilot project that would see thousands of pounds of wasted fish diverted to Winnipeg food banks. Dean Rennie, a Master's student at the University of Manitoba, is working with McKay to develop and document this pilot project. He explained to The Dominion that the project would see by-catch, “the unintended capture of non-target species,” within the Grand Rapids fishery being documented and donated to Winnipeg Harvest, Winnipeg’s largest food bank. The problem, according to Rennie and McKay, is exacerbated by regulations stemming from Manitoba Conservation and Water Stewardship, a provincial government department that issues commercial fishing licenses under a strict quota system. To get rid of unwanted by-catch, many fishers illegally “bush” or throw out the non-target species brought in by their nets. According to Section 16.1 of the Manitoba Fishery Regulations and Section 36 of the federal Fisheries Act, “bushing” by-catch is illegal. However, the practice is reportedly widespread in all fisheries, including those serviced by FFMC. It is estimated that over 3 million pounds of fish are wasted annually in the Lake Winnipeg fishery alone. However, no official documentation and no firm numbers exist in relation to the problem. Rennie and McKay have proposed their pilot project to the province, in part in order to provide data to the Manitoba Conservation and Water Stewardship about the extent of by-catch-related waste within the commercial fishery in Grand Rapids. But the province is not interested and has refused to take part on two occasions since 2010. According to documents obtained by The Dominion , because of the proposed project’s “illegal nature,” as well as issues relating to the provincial quota system administered by Manitoba Conservation and supposed “financial incentives” that the project would provide fishers in the Grand Rapids area over other fishers on Lake Winnipeg, the province is currently unwilling to work with Rennie, McKay and the Grand Rapids Fishers Co-op to move forward with the project. However, no further information as to how or when this would take place was provided. Whether arising from structural inefficiencies or the problems created by overlapping jurisdictions in the Manitoba inland fishery, it is clear that there are problems with the current system under the Freshwater Fish Marketing Act that are resulting in millions of pounds of wasted fish and lost economic opportunities. With the long-term environmental and economic sustainability of the fishery at stake, it is beholden on the federal government, the government of Manitoba, FFMC and the fishers on the lake to work together to solve these problems before irreparable damage is done to the fishery, and the remote, northern communities that rely on it for survival. Sheldon Birnie is a writer and editor living in Winnipeg, MB. He has a Bachelor of Environmental Studies from the University of Manitoba. Submitted by Alex Paterson on Thu, 11/08/2012 - 08:02. Bushing and throwing by-catch overboard are different both in fact and legally. People also seems to forget animals and birds consume the bycatch almost immediately after it is tossed. When I went commercial fishing the gulls and bald eagles just followed us around and ate all the tullabee and non-marketed perch the fisher tossed back. Submitted by Arby on Tue, 12/11/2012 - 02:09. In the neoliberal era, the people are dealing with captured governments, run by ideologues and zombies who don't believe, conveniently, in government and are therefore happy to sabotage it. To put it another way, those ones believe in the kind of government that the Trilateralists desired to introduce us all to, namely governments within a framework of "weakened democratic institutions," or in other words, governments within a wider society captured by special interests (pg 53 of "Silent Coup - The Big Business Takeover Of Canada," by Tony Clarke). That would be a way to protect the vital 'captured' government from the hoodwinked people who might, after a period of abuse, remember that governments of and by and for the people, as in 'all' the people, might be a good idea, especially when uncaring, unprinciple exploiters show no hesitation in using government to behave like brutal gangsters. Trilateralists see any hint of life - any interest shown by the people in how they are governed - among the "bewildered herd" as a "crisis." "The solution to the crisis, they said, was a stronger government in a weaker democratic framework. In order to effectively coordinate and plan changes in national economies required to facilitate transnational investment, governments needed to have more centralized authority and be less susceptible to the diverse demands of citizens' movements. The media should be disciplined through stronger libel laws and restrictions put on public access to government information." (pg 45) But that's okay. It's not as though we are talking about getting information from governments that belong to us and to which we would be entitled. The size of government is one discussion and often the discussion that special interests steer us toward when we might threaten to talk about the composition of government. Both discussions are fine. But being tricked into not having discussions we need to have is not fine. The elite democracy that exudes from the Manitoba government, as revealed in this article, speaks volumes. It's just another captured, neoliberal government. The missing in action politicians who make it into government, slump in their chairs and tune out the dinge of the rabble outside who they used to make it into their comfy place in the mafia capitalist order and would have us believe that 'that' is democracy. It isn't. When they are mismanaging - if there is 'any' managing in a positive sense going on - and that's pointed out to them, it isn't like a song on the radion that you ignore if you don't like it. It's undemocratic and criminal. The Manitoba government, and all governments, should (and would if they weren't captured) not be making decisions dictatorially. When the matter is controversial and important, governments should be asking the people (not a minority of special interests) how to proceed. Do you see that happening? Anywhere? Politicians today aid and abet criminal capitalism. Then when the people, the victims, squawk, they might notice. They often notice and send out the (paid) police to criminalize the political dissent and outcries of the victims of their criminal private sector partners. That's their job. *Dominion: Please ditch your abusive commenting system and get one that isn't abusive. Submitted by Tim McSorley on Thu, 12/13/2012 - 11:55. I'm one of the editors with the co-op. Can you explain what it is you find abusive about the commenting system? Thanks. Submitted by Arby on Thu, 12/13/2012 - 20:27. You don't know what you're serving? Okay. My suggestion: Ditch what you're using (not simple, not user friendly) and go with Disqus. I don't know what that means resources-wise so I can't really say too much about what you decide. I have less than zero resources and can't donate to useful sites like yours, so I guess that limits my ability to have input. That's it.